1. If using oil: whisk everything but the egg together in a bowl. If using applesauce: whisk everything but the egg and applesauce together in a bowl. 2. Loosely place plastic wrap on the bowl and leave it out for 3 hours. 3. With the plastic wrap on, store in the fridge overnight. 4. 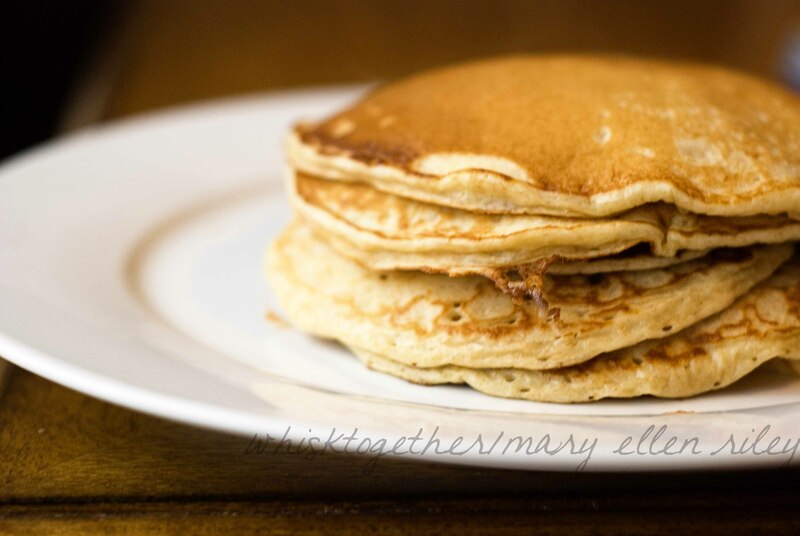 Now that it is morning, add in the egg or egg and applesauce. 5. Heat your electric griddle or skillet to 300 degrees. Or, heat your large skillet to medium. 6. Add 1 tsp. of vegetable oil and 1 tsp of butter to the skillet. 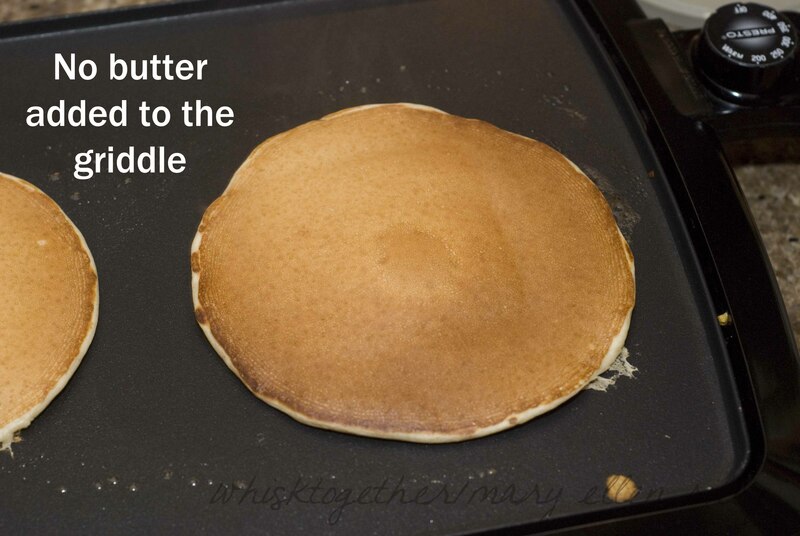 Once the butter melts, pour a little less than 1/2 cup batter into the pan to make a 9″ circle. 7. After about 2-3 minutes, the pancake should have some little bubbles and be brown on bottom. Flip and cook another 1-2 minnutes. 8. Continue with the rest. 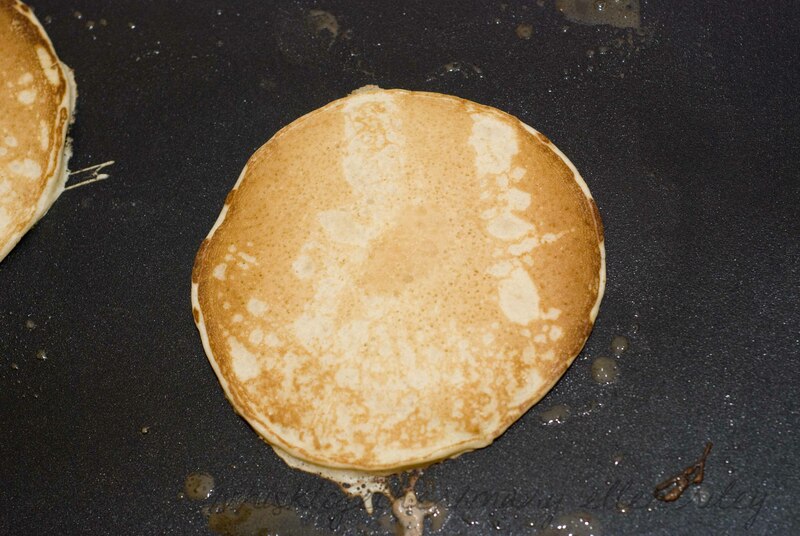 I was able to make about 2-3 big pancakes on my griddle like this. Serve with syrup, or yogurt, fruit and brown sugar, or sour cream, etc. This is what happens when you don’t use the butter/oil on the skillet. No crisp edges. No pretty swirls.